Thangka, is a Tibetan Buddhist painting on cotton or silk applique. It usually depicts a Buddhist deity, scene or mandala. The word “Thangka” literally means “Things that one unrolls” in classical Tibet. Traditionally kept unframed, they are usually rolled up when not in use, though they are sometimes displayed briefly during religious festivals. 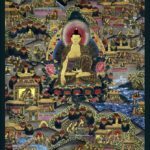 Thangka serve as important teaching tools depicting the life of Buddha, various influential lamas and other deities and bodhisattvas. 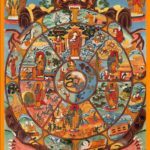 One subject is The Wheel of Life (Bhavachakra) which is a visual representation of the Abhidharma teachings (Art of Enlightenment). Some thangka also depict historical events concerning important lamas, or myths associated with other deities. 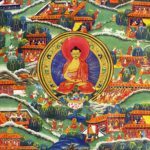 Most importantly, thangkas are used as a meditation tool to help one further down the path to enlightenment. Buddhist vajrayana practitioners use thangka images of their yidam, or meditation deity as a guide, by visualizing themselves as being that deity, thereby internalizing the Buddha qualities. 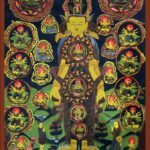 Thangka paintings developed from widespread traditions of mural paintings, which now survive only in a few sites such as the Ajanta caves in India and the Mogao Caves in Gansu province, China. 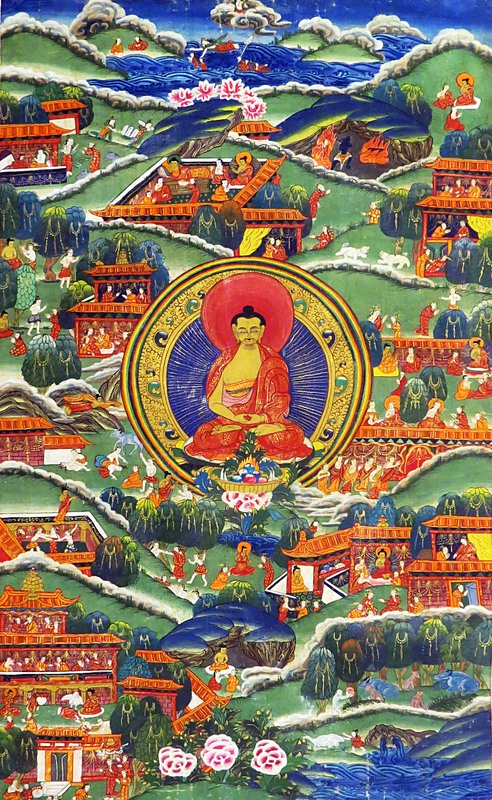 Most thangkas are commissioned by individuals, who were believed to acquire merit by doing so. Some thangka have inscriptions behind them recording that they were personal meditation thangka of a notable monk. Most artists were probably monks, although lay artists also existed. Though rarely signed, some artists are known more because they were important monastic leaders rather than accomplished artists. Painting, however, was a valued talent in a monk. 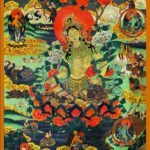 Surviving thangkas on cloth from Tibet itself start in the 11 th century, after the revival of Buddhism. Such early examples typically have compositions that are already complex, but less so than in later examples. As later the typical compositions shows a central figure flanked by other smaller figures, often in framed compartments, or surrounded by flaming halos or seated on small clouds. Behind these figures a landscape background including much sky is often indicated, though little of it may be visible. The central figure may be a deity, and arhat, or an important monk, and the same groups make up the background figures. Several of the figures may be different “aspects” or reincarnations of each other according to Buddhist theology. 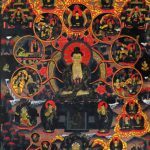 Other traditions of Buddhist scroll paintings are not usually covered by the term thangka, although they may have many similarities, and descend from the same origins. An example is Japanese paintings, where a number of very early examples survive from the Nara (710-794) and Heian periods (794 to 1185). Most of these are National Treasures of Japan. Raigozu developed as one popular genre, showing the Amida Buddha accompanied by bodhisattvas welcoming the souls of the faithful to his Western Paradise. These were, and still are, carried into the house of a person who was near death.